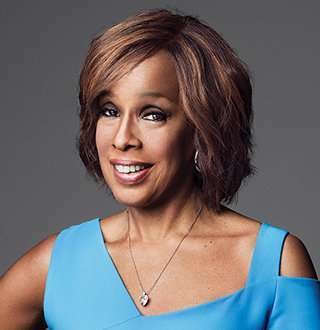 Gayle King is well known to many as the cheerful host of CBS This Morning and loyal best friend of Oprah Winfrey. With her cheerful nature, her personal life reflects something different than her professional nature. So, if you want to know about her personal life ranging from marital bond to divorce life, then keep scrolling down! The CBS Television personality, Gayle King got married to the lawyer William Bumpus back in 1982. But after the long 11 years of their marriage, their marital bond ended with divorce, back in 1993. The couple shared the two grown-up children, son William Jr., and daughter Kirby. Back in 2006, the host of CBS News opened about her married life that, she was married to a "cheater." Well, she revealed to the August issue of Vanity Fair that, she is not the huge fan of the woman that she caught naked with her then-husband back on June 24, 1990, at 9:16 pm. Well, after cheating on her, her ex-husband, William Bumpus, publicly apologized for being with another woman while being in the marital bond with the TV personality. Soon after this, Gayle King's ex-husband confessed to Page Six via a rep, Lisa Nkonoki that he's been "haunted" by the past repeatedly over the years and despite dealing this privately, he publicly apologized for the major transgression that dramatically changed all of their lives. The former assistant attorney general for Connecticut, William further added that he has nothing but the utmost respect for Gayle and "eternally grateful" for what she has done. He also accepts the fact that, Gayle was a great wife, an excellent mother and a fantastic co-parent. Following the tragic event on her life, she went on to marital counseling for the mental recovery and claims that it worked it out and it has all healed and she has overcome from that since it was more than twenty years back. "It's so important for people who have children together to get along. Regardless of how you feel about the other as a spouse, you still have these children to raise together." The 63-years old host has been living the divorcee life since her late 30's, so has she been in search for a new partner? It was in August 2018 that Gayle went on a vacation with her best friend, Oprah Winfrey as they adventured off the Mediterranean coasts of Montenegro and Croatia. Gayle couldn't help but gush about the vacation to the People as she called the season the 'Summer of her Life.' The two friends experience the inexplicable time of their lives as they were joined by fashion designer, Diane Von Furstenberg. The 63-year-old host is frequently posting pictures on her Instagram to let the fans know about the ongoing vacation she's going through and seems like Winfrey is totally laid back on this holiday with her best friend. Well, Gayle interviewed with Vanity Fair seems she has finally moved on. She told Vanity Fair that, she is single now and has not engaged in any relationship, and she'd let her fans know if she meets the greatest love of her life. She also disclosed the qualities in a man that she seeks. She told that its a tie between height and depth and they have to have a good sense of humor. In an episode of 2002's The Oprah Winfrey Show, the two best friend, Oprah and Gayle talked about Gayle's worst dating. Gayle's worst date include her date with a man who could not speak properly in the Million Man March in 1995. Even after two years of Gayle's divorce, she could not find the perfect man for her. And it was the time she reconnected with her high school sweetheart, but the things did not go well with him. They spend the weekend together. However, back in 2017, she revealed that she had gone to date many times and would like to have an unmarried boyfriend. In an interview on daytime talk show Harry, she explained that on her dinner date, the person sitting across her was a married man. "I went on a date recently, I've been out with somebody maybe three or four times and now I feel I have another dating question to add to my repertoire." Notably, Gayle seems to have multiple dates and even has a boyfriend. But as of now, she looks to be walking her path with her grown-up children.